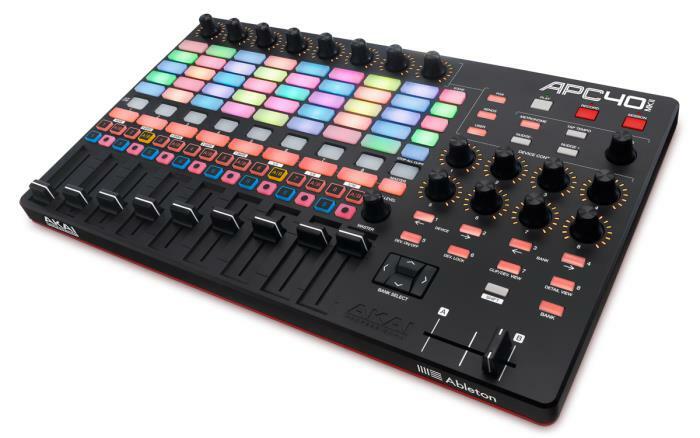 The APC40 MKII is Akai Pro's most equipped Ableton Live controller to date. We at GAK thought the APC40 was great, but Akai have really outdone themselves with this one. Taking all user feedback on-board from the original, Akai have designed a controller with a huge number of musical capabilities, fantastic functionality and a simple layout. 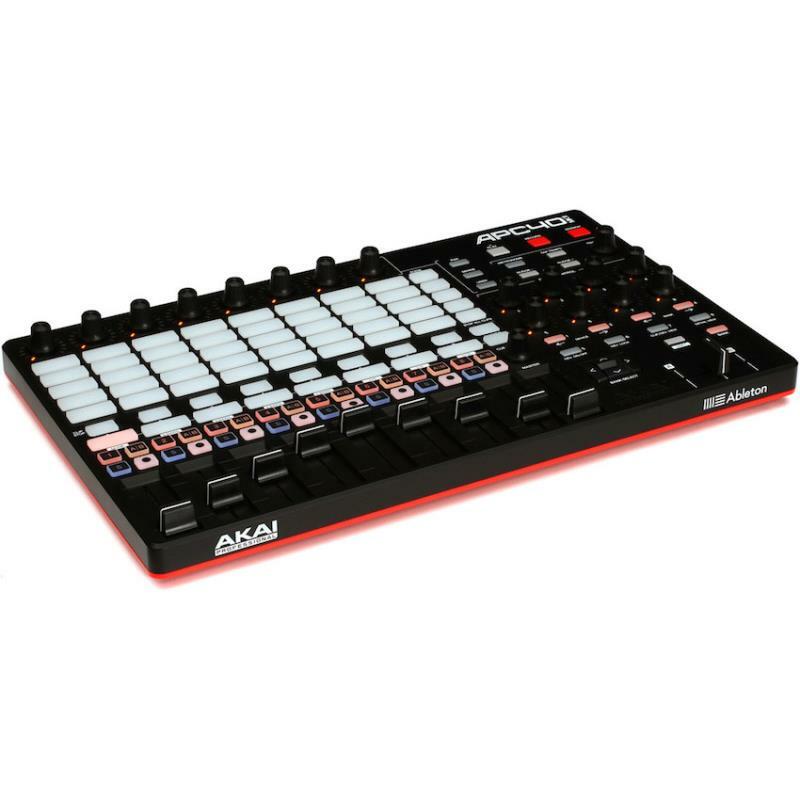 The Akai APC40 mkII features a 5x8 RGB LED clip-launching matrix, assignable A/B crossfader, 8 rotary knobs, 8 channel faders, and a send button for quick access to send busses. This piece of kit is ideal for all producers that love to use Ableton Live when performing, but remember, the APC40 can also be mapped for other software. APC40 mkII features a 5x8 RGB clip-launching grid that’s built for dexterous exploration: launch clips and create or perform your song from the ground up using 40 responsive triggers. RGB lighting provides visual feedback and displays three clip statuses—loaded, playing, and recording—so you can intelligently perform without looking at your computer. You can also colour code your clips with the RGB lighting for advanced visual organization, and use the Shift button and directional arrows to manipulate the scope of the 5x8 grid. APC40 mkII comes pre-mapped to Live (version 9.1.3 or later) for an instant performance and production setup. When APC40 mkII is plugged into your computer, its hardware controls correspond 1 to 1 with Ableton Live’s interface—no additional configuring is required. In addition, all of APC40 mkII’s controls can be re-assigned on the fly for customised setups that change with your performance or production style. APC40 mkII is also powered over USB and supports plug-and-play connectivity, allowing you to take this controller from the studio to the stage or wherever you go. Whether you are an electronic music artist and Live is your canvas, a DJ using Live for performance and real-time mixing, or a more traditional musician using Live on stage or in the studio, you will find the APC40 mkII to be the intuitive, powerful instrument that directly links your inspiration with Ableton Live. APC40 mkII comes packed with a music production suite that includes a version of Ableton Live, two high-definition virtual synthesisers, and 5GB of professional samples and loops for immediate out-of-the-box music creation. Ableton Live Lite enables musicians and producers to spontaneously compose, record, remix, improvise, and edit musical ideas in a fluid audio/MIDI environment. Also included is the Puremagnetik Effect Racks, a collection of over 200 sophisticated audio effects engineered for instant sound sculpting. 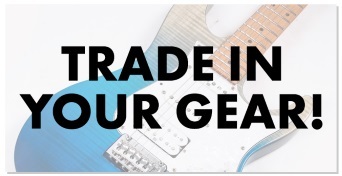 This collection comes packed with an endless variety of channel strips, DJ and live sound effects, glitch racks, amp racks, modulators, filters, beat processors, and noise boxes. SONiVOX Twist is a spectral morphing synthesis virtual instrument. Comprised of a dynamic interface, an advanced pattern generator, and onboard effects, Twist lets you create serious sounds using simple controls. Finally, five Toolroom artist launch packs and five Prime Loops sample packs feature an eclectic mix of sounds from today's electronic music scene. 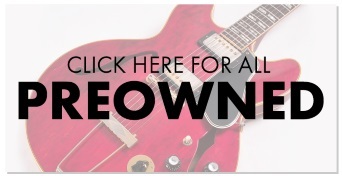 Jumpstart your inspiration with these premium instrumental loops, drum kits, one-shots, and more.